A small game for 'So bad it's good' jam. But it's mostly bad. I'm almost proud how bad it is. Nice! and Thanks. Will take a look. Well done on coming second HAUO! Could you contact me on the jam's Discord server? Thank you! I just started with Flappy Bird as a base, then wanted to se what could be done after. I wanted a story/character of some kind, I wanted to add some kind of upgrade element, and while adding these thing it become this odd thing. I agree that the "geting started" thing is a bit vague, might add a clue. I'm glad I found it, too! Good work on the game! It's pretty awesome. I have that song stuck in my head now. But this is addicting! It was hard not to stop. My high score currently is 5 lol. Good job! It really was so bad it's good~! This game is brilliant and what I would rate as a good bad game. It's awful in many ways but still works as a game. I had a lot of fun playing it and I'd buy this if it was an app. Haha! Thanks! 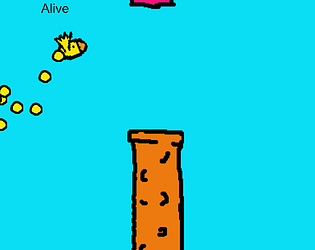 Its really the worste game I have ever made, but was still fun to make. I even made the music myself, a first! even if its bad. Glorious! "Silly bird you died!" I didn't get to the Lazer Shoot part - is that something the bird can do, or is it an obstacle? Thanks :) The secret is that you can always continue, even if you die. Give it another try if you have time.